Born on the coastal regions of Oto Island (located near the Bikini Atoll, where he was affected by nuclear tests), Godzilla became a modern god, feared by the fishing villagers on that island, and ultimately, all of Japan. Standing at a towering 50 meters (164 feet), he is a powerful demon of destruction. The first release was made with a much lighter and brighter green plastic, was painted (the eyes and mouth) very brightly, and had weights in the bottom of its legs. The yellow plastic claw/foot bottoms has a reinforced ring that inserts into holes in Godzilla's legs (the weights reside in these inserts). The second release was made from a darker green plastic and had no weights in its legs. The face paint was less garish and more subdued. The third release was almost identical to the second, but Mattel got smart and reinforced the red lever after customer complaints of its snapping off. There is also a variation of the tail, which has small fins molded on the top. These are missing on most figures and I'm not sure where the variation fits in. As a note, the Japanese release of Shogun Godzilla had a speaker in its chest, with a pull string so you can make Godzilla roar! 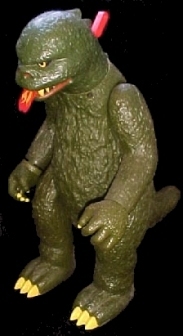 CONTENTS: GODZILLA™ figure 19 1/2" tall, wheels on his feet, flashing tongue with pretend "flame" and claw that can be launched! Tail requires ASSEMBLY. Claw not for use with all SHOGUN© Warriors. Distributed by Mattel, Inc. Hawthorne, CA 90520. MADE IN JAPAN. Manufactured by Bandai Co. Ltd.
SHOGUN® is a US registered trademark of Mattel, Inc.
Godzilla is copyright TOHO Co., LTD. All Rights Reserved.